Well, we are now off to a new calendar year, and the 4th edition of my weekly BullCharts software Tip Sheets, after trying to have a couple of weeks off over the Christmas period. If you don't have a lot of time to devote to share selection and trading, you might be watching quarterly charts with a simple indicator like the Bollinger Bands. And you might watch the XAO index for an indication of market health. Depending on parameters and how you interpret the chart, you could have been into the market in July 2003, and out in April 2008, and missed a lot of the recent carnage. This topic will be covered in more detail in the Share Trading articles in my monthly eNewsletters in the near future. In the meantime, you might want to open up BullCharts and look at a chart of the XAO (All Ordinaries), quarterly, over this period, with the Bollinger Bands indicator inserted. Please feel free to send me feedback, or requests for additional topics. The scanning module is a key feature of the BullCharts software product. It allows you to set up one or more stock selection criteria, and to scan through a specific list of stocks to identify only those stocks that match the criteria. In the brief notes below, I briefly touch on a sample trading strategy and a supplied "author scan" that comes standard with the BullCharts software. This topic is covered in much more detail in my monthly eNewsletters - in particular the second one (reference BC-10-110) in November 2008. You can see a preview of the BullScan article in that newsletter on pages 5 and 6 of the preview PDF document (from the web site, follow the links to Monthly eNewsletters, and then the 2MB PDF preview document, or just click on this link to go direct). Future monthly eNewsletters will look at the basics of how to easily customise scans, and how to write your own. If you want to receive the full monthly newsletters you will need to subscribe. You can do that from the link to my online shop on this page. In a bear market environment, we might want to search for stocks that are "breaking out" above a down trend line, or above long term resistance. See the sample chart here. Especially on higher volume (which suggests buyer support for higher share prices). Let's say you are a longer-term trader, browsing through weekly charts once each week, and you want to search through all stocks in the S&P/ASX 200 index for a potential price breakout. The Closing price is between [the previous Close + 5%], and [the Previous Close + 1000%]. The Volume is between [the previous Volume + 30%], and [the previous Volume + 1000%]. 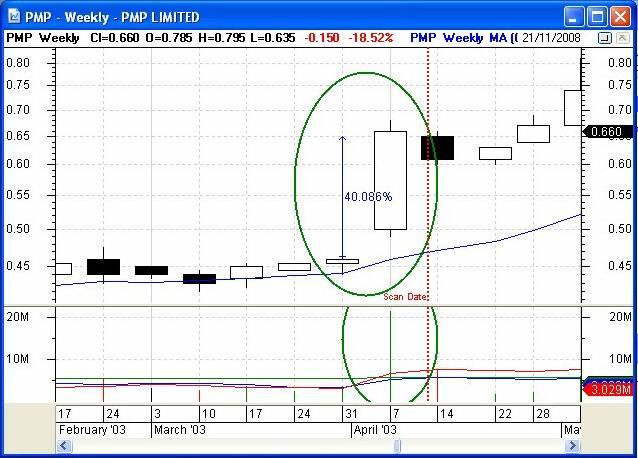 The share price Low crosses above the 14bar SMA (Simple Moving Average of the Close). Close is between 20c and $100. The BullCharts software comes bundled with more than 120 supplied scans, and many of these are based on Author Strategies. One of the many supplied Author scans in BullCharts is "Leon Wilson's Breakout" scan. You can find this in the list of Scans (browse the list of scans, sorted by author). You should open this scan, and check the scan criteria, and then check the list of Securities to be scanned (you can easily change this). Time period - daily, weekly, monthly, quarterly. Scan "as at" a specific past date (generally going back as far as 1987). The list of securities to scan through (can be one of your watchlists, or one of the supplied indices, or sub-index industry groups). New scan criteria can be created, to build up a list of many criteria. An existing criteria can be changed (there are many, many options to choose from). The sequence of scan criteria can be easily changed. More details on scans and how to create and customise them are included in my monthly eNewsletters that are available to subscribers (for a very modest amount). Feel free to click on the relevant link at right to view samples and more details. These weekly newsletters for BullCharts* users are intended to be short, quick grabs of information. They are not a replacement for the monthly detailed eNewsletter that I publish, which might cover these same topics but in much more detail. The eNewsletters also cover Technical Analysis and Share Trading topics. Note: Any screen shots shown in this newsletter are snapped from BullCharts version 3.8 (which will be available very soon). FEEDBACK? - I am very keen to receive feedback about these weekly BullCharts Tipsheets. Please feel free to email me with comments, or suggestions. * - BullCharts is: "...an innovative charting and technical analysis system. It provides a feature rich and powerful set of tools with access to the latest strategies from local and overseas authors in analyzing the dynamics of the stock market."